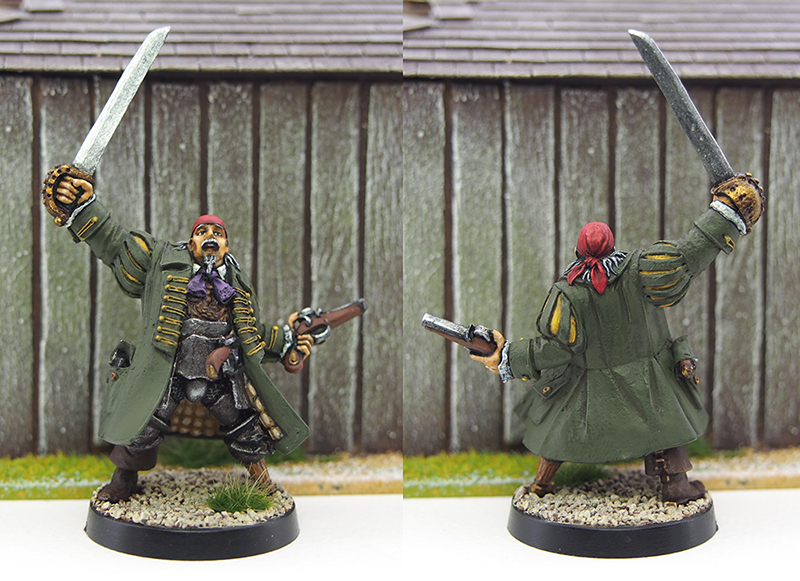 Another miniature finished, this time a pirate from Hasslefree. I’ve been putting off painting him for a while, and the reason is the Hasslefree curse: I love HF minis, but because of the high quality of the sculpts they always feel intimidating, and I find myself thinking I can’t give the mini enough attention. In the end I’ll paint them, enjoy it and love the end result. It has happened before (notice how I’m talking about the same thing on that post, and that was in 2012) and this time was no exception. The miniature being very characterful, I once again found myself concocting a background story, as I tend to do while painting. So was born Jean Blanc – the Unkillable Frenchman. Pirates like Blackbeard would often count on their fearsome reputation to do their work for them as, after all, it was always better if you could take a ship without firing a shot. I applied this theme to the portly French pirate as well. He was wearing a padded coat and heavy armour, so I assumed these had obviously saved his life more than once, contributing to the legend of the Frenchman impervious to pistol balls and blades. I painted his hair grey to suggest he has been surviving on the seven seas for some time. This nicely tied in with his name, which in turn was a nod towards the original inspiration for the sculpt. “The Devil takes care of his own!” say the British merchants. “Non. C’est simplement une abondance d’armures” thinks captain Blanc according to Traducteur nommé Google. The captain was great fun to paint. A well-sculpted miniature will do that! No guesswork on facial features, no lacking definition or the usual annoying little problems often found on minis. It’s much easier to paint a nice miniature to a good standard. There were some quality issues uncharacteristic of Hasslefree, namely some pitting of the metal on the sword and the back of his coat, but nothing serious. I went for a combination of bright and subdued tones, and picked a darker skintone than normal. After complaining in my previous post about laying paint on too thick, I paid extra attention to thinner layers and utilized my wet palette to what I think is good effect. For once, I’m really, really happy with a finished mini! I even painted some freehand wood grain on his peg leg, and I all but hate painting freehand. That’s miniature #4 of 2017 finished. I’m going on a six week trip to Malaysia and Indonesia starting next Sunday, so that will sadly put an end to my painting for a month and a half. Still, I can think of far, far worse distractions, and obviously I’ll be taking a bunch of pirate books along for some holiday reading. Great work on this mini. You should have lots of confidence now! Indonesia will be great inspiration to paint more pirates, have a great time. Thanks Carl! Looking forward to the trip, going to see some colonial buildings in Malaysia as well, so there should be plenty of inspiration on the way! Wow man. Your finest work yet I’d say. Really love the details on the Unkillable Frenchman. The peg leg is brilliant and all the coat details are perfect. I’m really resisting the urge to follow your lead and start building up an old pirate town haha. I think 2018 might be the year for that for me. This year is full of projects already. Keep up the amazing work sir. I’ve started dreaming about and planning a pirate themed project all because of you and yours haha. I want to build a pirate island sectioned into four warring provinces. I’m not sure if I’ll start this year or next. The island will be quite big so I need space haha. Just thought I’d let you know. 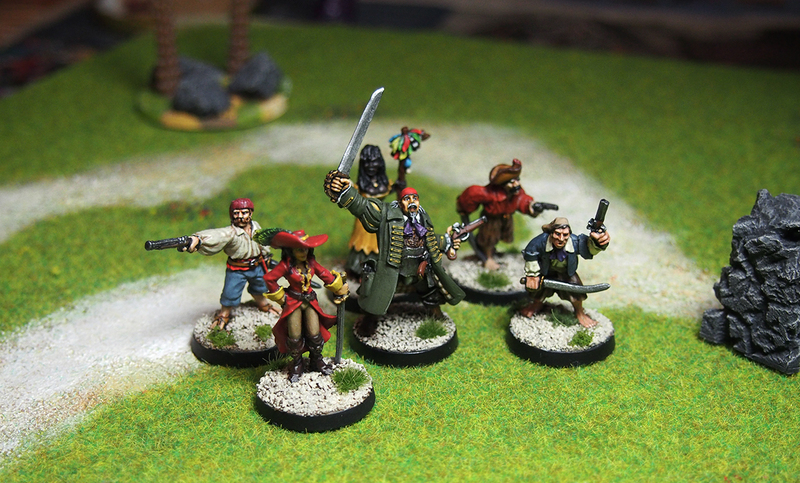 If you could, want to, would you be able to post a list of all the pirate miniature manufacturers you’ve used or know if? I think I’ll mostly use foundry and black scorpion. I haven’t explored hassell free yet. Excellent, looking for to seeing this come to life. As it happens, I’ve compiled a fairly comprehensive list of various pirates and ships on th Random Platypus forum: http://www.randomplatypus.com/forum/viewtopic.php?f=27&t=1645 which I think you should be able to view. If not, just sign up as it’s a lovely little place anyway! I wasn’t expecting you to reply so soon jaha. Thanks man. Have you got pirate ships? Nice work… I know how you feel about Hasslefree figures but you needn’t be worried as you have done a fine job! Thanks Warburton, much appreciated! This has got me thinking I should paint more HF in the future, so maybe the curse is lifting. Yep, top notch mate, Jean is superb. I love that sage green & yellow for the coat, and the brighter spots really lift the whole piece – he’s a perfect character. Cheers Alex! I was going for a more muted bandana, but consulted my girlfriend who insisted on red. Good call! Excellent paint work. I forwarded this to my facebook page.